For Immediate Release: Posted On 11/3/2009 By Industrial Magnetics, Inc.
Industrial Magnetics, Inc. patented family of Transporter® magnetic end-of-arm tooling will be on full display at FabTech ’09. Transporters® magnetically transfer metal blanks, stampings & parts in automated station-to-station, press-to-press transfer or robotic pick-and-place applications, among many others. 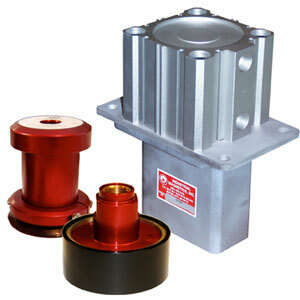 Engineered with powerful Rare Earth magnets that positively hold the part during transfer- even during unexpected loss of shop air - the Transporter® family greatly reduces chances for slipping and shifting of parts due to mill oil coatings, dust, dirt, rust or weld splatter. The Original Transporter® is designed for use on heavier gauge, non-flexing parts, and uses a single burst of shop air to actuate the magnet on and off; it is available in three standard sizes with holding capacities up to 670 lbs. Every Transporter® product provides more options for pick-up points on stamped, perforated and odd- shaped parts, and a significant reduction over vacuum and suction cups in shop air costs. In addition, all Transporters® offers more accurate placement on the die and quicker cycle times for increased production. Each is million-cycle-tested for endurance and incorporates a fail-safe feature that, in the event of air loss, prevents the magnet from releasing ferrous parts. IMI specializes in custom designs, providing Transporter® product for coil lifting, banded material handling and other challenging applications. A full line of accessories and fittings are available, and standard list prices range from $274-$1088 per unit.